Hi there it's Christine here at Magenta. This week I have a gelli plate print using distress oxide ink to share with you. I covered the gelli plate using the distress oxide ink pad then brayered the surface to blend the inks. I then stamped the surface with the bubbles stamp to break up the colour and add a little background interest. 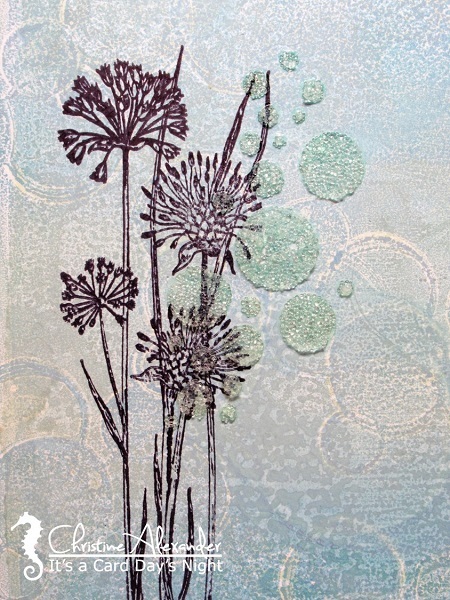 I used coated card to pick up the colour from the gelli plate and stamped the garlic flower in ranger archival ink. 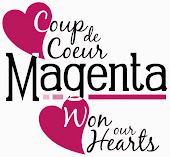 Bonjour, c'est Christine ici à Magenta. Cette semaine, j’ai une impression sur "Gelli Plate", utilisant une encre Distress Oxide, à partager avec vous. J'ai recouvert la plaque gelli à l'aide du tampon encreur, puis j'ai utilisé un rouleau encreur sur la surface pour mélanger les encres. J'ai ensuite étampé la surface avec l'étampe de bulles pour casser la couleur et ajouter un peu d'intérêt à arrière-plan. J'ai utilisé une carte couchée pour prendre la couleur sur la plaque et j'ai étampé la fleur d'ail à l'encre Archival. This close up shows the effect the distress oxide on the gelli plate and then the print you get. One of my favorite mixed media products is Glass Bead Gel used with a stencil. You can also see how pretty the glass bead gel is in this picture. Ce gros plan montre l’effet de l’encre Distress Oxide sur la plaque gelli, puis de l’impression que vous obtenez. L'un de mes produits mixtes préférés est le gel à billes de verre, utilisé avec un pochoir. Vous pouvez également voir à quel point le gel des perles de verre est joli sur cette photo. Fantastic card Christine. 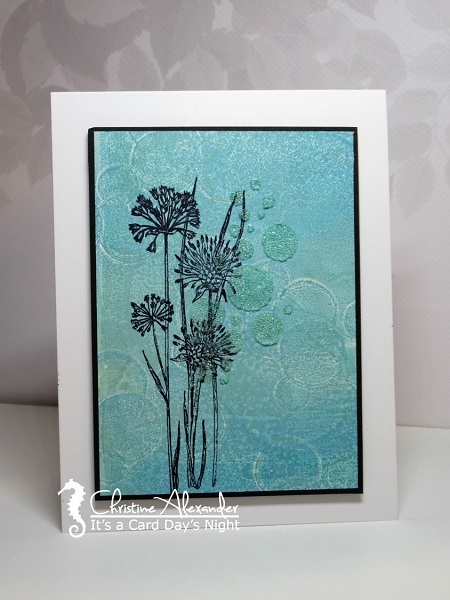 I can see the texture on your background from stamping over your inks on the gelli plate. Very cool! The glass beads really stand out against the beautiful silhouette flower. Beautiful , Christine. So much gorgeous texture and dimension. The beads are so cool. Fabulous layering of ink, stamping, and glass bead gel! Love the colours in the background.